If you have read the other entries in this series, you have noticed that the discussion has been exclusively about composers of opera. We can now take a brief look at purely instrumental music in Italy —or the lack thereof. In "Italy's Ottocento [the 1800s]: Notes from the Musical Underground" in The Musical Quarterly 56 (1): 27-53 (1970) author Bea Friedland refers to what she calls "an almost unexplored segment" of music; that is, "…the orchestral and chamber music produced by Italian composers in the 1800s." There was, in fact, a substantial body of Italian composers in the 19th century trying to work in non-operatic musical forms. Among them were Antonio Bazzini (1818-97), Giovanni Sgambati (1841-1914); Antonio Scontrino (1850-1922); Giuseppe Martucci (1856-1909), and Marco Enrico Bossi (1861-1925). They composed symphonies, string quartets, sonatas, and concertos, but in spite of recent attention by musicologists, their music is still largely unexplored and obscure, except to historians of music. From the above list of names and within the brief scope of this article, we can look at the local composer, Giuseppe Martucci, as being representative of the others. In spite of his dates (1856-1909) Martucci wasn’t up against the great Italian operatic composers. No one thought of comparing him to Bellini, Donizetti, Verdi, or his own contemporaries such as Puccini, Mascagni and Leoncavallo. He was simply “out of the running,” so to speak, because he wrote absolutely no (!) operas. Not one. Martucci was born in Capua, was clearly a child prodigy in music, and was admitted to the Naples conservatory at age 11. He toured internationally as a concert pianist starting in 1875 when he was only 19 and was appointed a professor of piano at the Naples conservatory only 5 years later. Martucci became director of the Naples conservatory in 1902 and counted Ottorino Respighi among his pupils. He was also a conductor and helped introduce the music of Wagner and of the late-Romantic symphonists of northern Europe to Italian audiences. He started to compose at age 16; he wrote many chamber works for piano plus other instruments, instrumental sonatas, two piano concertos, and two symphonies. It is especially the two symphonies that show his enthusiasm for the German orchestral sounds of the late 19th century. 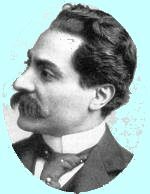 A later Italian composer, Gian Francesco Malipiero, called Martucci’s Second Symphony "the starting point of the renascence of non-operatic Italian music.” It was a rebirth that produced the music of Malipiero, himself, as well as that of Alfredo Casella, Franco Alfano and Respighi. Arturo Toscanini and Martucci were friends, and the conductor held a memorial concert in Naples upon Martucci’s death in 1909 and continued to include Martucci’s music on concert programs. Politics rears its delightful little head in Italian culture around the turn of the century. Nascent Italian nationalism and colonial expansion in Africa produced a climate in which “alien” forms such as symphonies were spurned in favor of “pure” Italian melody. And then the passing of Romanticism (yes, sorry, it’s dead) changed all music to the extent that the “renascence of non-operatic Italian music” now seems more wishful thinking rather than a statement of fact. Certainly, composers such as Martucci are still waiting.